After spending the day in town to resupply and gather themselves, the party set back out to find the goblin burrow in the woods. After traveling for the day, Ander managed to lead his companions to the entrance. Lighting a lantern the party squeezed down the narrow passageway, clogged with stones and deep tree roots. The pathway twisted and turned as the party pressed on through the claustrophobic space until the found a hole that dropped into a flagstone room. Tied to thick roots were three chains that hung into the chamber below—the means by which the goblins could come and go. One by one the party descended into the chamber 40 feet below. Once there, they found themselves in a 20 by 20 room, with a corridor leading to the north, and another to the south. From the north, the sound of goblins speaking could just barely be heard—so they headed towards the sound. Coming around a corner the voices got louder, and the hall descended down a staircase that ended in a set of double doors—the voices were coming from the other side. Several goblins could be heard talking with one another, and another 2 or 3 could be heard squabbling of a game of cards (Ander speaks Goblin). Realizing the goblins were unaware of their presence, the party burst into the room to launch an attack. Sitting around a table, playing cards, were 4 goblins, and in the far end of the room were another 8 goblins relaxing among a pile of dirty animal furs—jumping to their feet when the doors burst open. The party launched their attack, with Broak and Audrey leading the way. In an epic—an somewhat comical—feat of agility, Audrey leapt into the fray by launching herself off of Broak's helmeted head with her foot. As they began cutting down the goblins, 2 broke for a corridor that led to the east. Positioning himself near a group of goblins and the table, Grabby made a gesture with his hand and spoke some arcane words that unleashed a thunderous crack that shook the chamber, dislodging small stones and dirt from the ceiling—and alerting everyone in the area—sending several goblins flying through the air, landing on their backs. In addition, the heavy oak table flipped through the air, sending cards and shillings all over the room. The table landed squarely on a goblin that was knocked onto his back, crushing him with a crunch and a muffled scream. The 2 goblins that had fled were making their way to a door, and out into a corridor heading to the south. The party tried to chase the 2 down as they fought their way through the goblins, Ander chased them in to the hall just in time to see them escape through another set of doors at the end of the hall. Just before they slammed the doors behind them, Ander got a brief glimpse of what appeared to be a human wearing dark robes move in the room beyond. With the rest of the goblins laying dead on the floor, the rest of the party spilled into the hall and down to the doors to continue their assault. From the other side of the doors and argument could be heard between what sounded like a human, and deep, gruff voice that spoke with a Goblin accent. "We need more time," said the gruff voice. "We need more, just get it done!" responded the human voice, which followed by the sound of grinding stone. Not wasting anymore time, the party was about to charge into the room, but the gruff voice, speaking in Goblin, shouted, "Get back out there!" and the doors swung open by 2 goblins suprised to see the party standing right there. Inside the room were several more goblins, and 3 hulking bugbears. In the room sat a table with a sizable pile of random loot on it. Ander fell back down the hall to provide cover from a distance as Audrey and Broak fought the goblins hand-to-hand, while Grabby provided support against any that got through. Eventually the bugbears manged to make their way to the front line to engage Broak and Audrey, dealing devastating hits to them both. Broak suffered a horrible cut to his abdomen that bled profusely (House rule: criticals with slashing weapons cause d6 bleeding at the end of a character's turn, unless they use a standard action to staunch the wound). As hits were delivered between goblins, bugbears, Audrey, Broak and Grabby, a goblin who was lurking in the room made several failed attempts to cast spells on some of the party, who eventually resorted to blasting them with magic missile spells down the hall. Broak, realizing he was in a bad spot with his wound still bleeding, hastily pulled a vial out labeled "VAPORS" in Dwarvish that he had found from their previous adventure, took a chance and chugged it down. The gambit payed off as is body suddenly became ethereal, and his smokey incorporeal form bagan floating back down the hall away from the battle so he could be healed by Ander. But Broak's tactic quickly turned south, despite being ethereal, his mortal flesh was still bleeding profusely, as he floated back he suddenly felt woozy and passed out from the blood loss—causing his form to revert back to its physical form. Everyone in the hall, ally and foe alike, was shocked to see the dwarf that had just escaped in a puff of smoke suddenly rematerialize just 10 feet away, and fall flat to the ground with a heavy THUD. 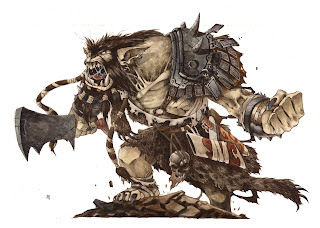 As the battle carried on Grabby also fell unconscious from his wounds with, when things looked their darkest, the tables were turned on the Bugbears with some well placed arrows from Ander, and a critical strike from the now raging barbarian, Audrey. With the bugbears defeated and the few goblins left (that had now retreated into the room) Audrey and Ander roused their uncnoncious friends and led the charge back into the room. They found one goblin trying to grab as much as he could from the loot on the table, and another that was standing in the corner of the room in the opening of an open secret passageway—the spell casting goblin was now already long gone. Killing the goblin in the passageway, the party chased after the last on as he dodged past the party and down the secret hall, but was felled by one of Ander's arrows. With the battle over, and Audrey very exhausted (she had gone into her barbarian frenzy twice so far), the party looked through the spoils. Finding plenty of coin, some red gems, and an iron ring set with a diamond bearing the icon of the demon prince of the dead, Orcus.